Lex Luthor spends his days trying to figure a way into Superman's Fortress of Solitude, always ending in failure despite his intellect. He has done this for many years and is still determined after all this time but something interrupts his thoughts... visitors. Superman and Superboy have arrived and, fighting armed forces, attempt to gain entry to the huge facility holding Luthor. Despite the better judgement of General Garrison he allows the two costumed men entry. Superboy is stunned at both the size of the prison for just one man and also Superman's authoritative presence. Anticipating his guests, Luthor showers, shaves and even irons his jumpsuit. He thinks back to the burn on the side of his face and missing chunk of ear, and whether Superman remembers causing it. At the same time Superman leads Kon up to and through an atmospheric portal seal. 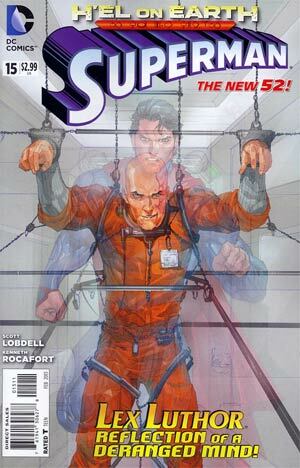 Kon comes to an incorrect conclusion of the past few days, telling Superman he is a prisoner, just like Luthor. Superman reminds him, that he is part human, part Kryptonian which is a mystery by itself that he plans on solving but also that it's his battle armor that is healing him. Soldier holograms greet them in the next chamber. Superboy is taken aback but Superman saunters past revealing them to be a wasted resource as the chamber is filled with 83% ammonium nitrate, a fatal poison to humans. Superboy is shocked that Superman allowed him to enter the chamber knowing it could have possibly killed him. Superman shrugs off Superboy's comments and reminds the teen that their priority is H'el. Superboy asks why, if the villain is their priority, they are seeking out a human? Each floor they descend has its own defense system from zeta operated gene attacking protomatter to chaos inducers. Finally outsider the main holding cell Superboy questions the designer of such a defense system. Superman grins that he tricked the prisoner into designing his own prison and leads the stunned teen into a chamber surrounded with antimatter cannons trained on the prisoner, Lex Luthor. Superboy comments that even with his telekinesis dampened he can tell Luthor is pure evil. Luthor grins and chides that evil knows evil. Luthor warns Superman that the teen should make Superman uncomfortable and asks if H'el is the reason for his first visit in years. Lex grins again but admits he isn't to blame for H'el, but he has been watching the stranger since Superman returned to Metropolis (Superman #1) as he apparently arrived at the same time. Superman asks how it is possible that he could know any current events from within his prison. Lex smirks and reveals he even knows that H'el is planning to time travel and stop Krypton dying at the cost of Earth, he offers to help but only if he can speak to Superboy. Superman refuses but headstrong Kon steps forward sparked by Luthor's cocky attitude. Luthor smells the boy and comments that he is an exquisite feat of creation though a pale combination of his 'parents' genetic stock. Superboy takes offense to Lex and demands the information on H'el that they came for. Lex refuses to back down threatening to continue his DNA unravelling if he doesn't show respect. Lex points out it is no mistake that H'el has barricaded himself inside the Fortress. With Kandor also kept inside (after it was taken from Brainiac) it houses a massive power source to maintain the bottle city. The first thought would be to power a time travel ship to pass through the Chronal Nexus. However since that isn't possible the only other eventuality is to use the power source to create a chronal reverse Big Bang by collapsing the solar system. Superman frowns and agrees, but Lex doesn't buy it. He points out that aside from his own super intellect, Superman is the only man with almost equal intelligence and therefore must already have come to the same conclusion. Lex growls that the only way to stop H'el is to kill him, like Superman had once attempted on Lex himself and failed. Knowing Lex is right Superman turns to leave. Lex calls out, that perhaps H'el isn't more powerful than Superman just willing to apply himself to his full potential where Superman has always held back. Superman remains silent as he and Kon return to the surface. Kon offers to invite the Teen Titans into the fight against H'el. Superman is less than happy to learn of a group of highly powered unsupervised kids, and insists they deal with the fight at hand themselves, after that they can discuss the membership in the Titans. At that very moment the Justice League arrive, commenting that this mystery facility is astounding and at the same time technically invisible to all maps and records. Superboy stops 'Man Flash' and comments that he has a similar team mate. Cyborg interrupts and asks why for the first time ever Superman has activated his distress beacon. Superman informs his friends that they have thirty minutes to save the world. To Be Continued In... Superboy #16 and Supergirl #16. Story - 1: While it was nice to see Luthor for his first introduction in the five years later timeline. The story itself was a mess, both structurally and editorially. In Superboy it is established the suit is HOLDING Superboy together right down to his molecules, not healing - but keeping him in one piece. Here though it's HEALING him and will be returned. Which is it? Why hologram guards that don't DO anything in a chamber full of poison gas? And a Superman of strong morals that it's established here WON'T kill was NOT reluctant to test the theory he COULD have killed Kon? Later the point of Superman's entire visit was not to actually defeat H'el but to look at his handywork and judge if he could best his mistake? I think I preferred the 'I killed pocket universe Zod' to this. Lex agrees to help Superman if he has an audience with Kon but he doesn't do anything with the opportunity. He didn't need to see the boy in person as he reveals he even knows about H'el disintegrating Kon's DNA. He clearly knows who Kon's parents are. So WHY? For the melodramatics? I know we're also expected to just take it for granted that Lex is super intelligent but when he reveals he knows the entire goings on of the past 15 months we aren't supposed to question the impossibility of it all? They have thirty minutes to save the world? Where did that come from? A terribly written chapter that features the reintroduction of Lex Luthor, arguably one of DC's deadliest villains, and we get a grinning maniac on the Joker's level... It could have been so much more, and knowing this is the Lex we have for the foreseeable future, it leaves me cold. I can only hope with the increasingly vague team work between the creative teams at DC, Lex will be written better in another title. Art - 3: It's a small issue for some but Rocafort's Superman previously looked in his very early twenties. This issue he looks much older and in a T-shirt he looks extra 'roided up. Superboy, who is generally drawn in his late teens in Teen Titans and his own book is regressed to barely thirteen and whiny with it. The art isn't terrible but having some constants in art would help stomach the inconstancies in the writing. Cover Art - 3: If you want to see a menacing face to face take a look at the latest issue of Young Justice. This makes Lex look like he is mimicking the wolf-man and given his knowledge of what is at stake it doesn't seem to fit the story at all.